A modern cyclotron for radiation therapy. A cyclotron is a type of particle accelerator. Cyclotrons accelerate charged particles using a high-frequency, alternating voltage (potential difference). A perpendicular magnetic field causes the particles to spiral almost in a circle so that they re-encounter the accelerating voltage many times. Ernest Lawrence, of the University of California, Berkeley, is credited with development of the cyclotron in 1929, though others had been working along similar lines at the time. As a cyclotron accelerates particles in a spiral path, it allows particles to be accelerated over a greater distance than a linear accelerator. Cyclotrons provide high-energy beams for nuclear physics experiments and ion beams to treat cancerous tissue. They may also be used to bombard other atoms to produce short-lived, positron-emitting isotopes suitable for PET imaging. Beam of electrons moving in a circle. Lighting is caused by excitation of atoms of gas in a bulb. The electrodes shown at the right would be in the vacuum chamber, which is flat, in a narrow gap between the two poles of a large magnet. In the cyclotron, a high-frequency alternating voltage applied across the "D" electrodes (also called "dees") alternately attracts and repels charged particles. The particles, injected near the center of the magnetic field, accelerate only when passing through the gap between the electrodes. The perpendicular magnetic field (passing vertically through the "D" electrodes), combined with the increasing energy of the particles forces the particles to travel in a spiral path. With no change in energy, the charged particles in a magnetic field will follow a circular path. 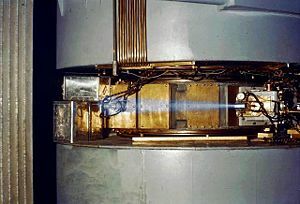 In the cyclotron, energy is applied to the particles as they cross the gap between the dees and so they are accelerated (at the typical sub-relativistic speeds used) and will increase in mass as they approach the speed of light. Either of these effects (increased velocity or increased mass) will increase the radius of the circle and so the path will be a spiral. The radius will increase until the particles hit a target at the perimeter of the vacuum chamber. Various materials may be used for the target, and the collisions will create secondary particles which may be guided outside of the cyclotron and into instruments for analysis. The results will enable the calculation of various properties, such as the mean spacing between atoms and the creation of various collision products. Subsequent chemical and particle analysis of the target material may give insight into nuclear transmutation of the elements used in the target. The spiral path of the cyclotron beam can only "synch up" with klystron-type (constant frequency) voltage sources if the accelerated particles are approximately obeying Newton's Laws of Motion. If the particles become fast enough that relativistic effects become important, the beam gets out of phase with the oscillating electric field, and cannot receive any additional acceleration. The cyclotron is therefore only capable of accelerating particles up to a few percent of the speed of light. To accommodate increased mass the magnetic field may be modified by appropriately shaping the pole pieces as in the isochronous cyclotrons, operating in a pulsed mode and changing the frequency applied to the dees as in the synchrocyclotrons, either of which is limited by the diminishing cost effectiveness of making larger machines. Cost limitations have been overcome by employing the more complex synchrotron or linear accelerator, both of which have the advantage of scalability, offering more power within an improved cost structure as the machines are made larger. 60-inch cyclotron, c. 1939, showing a beam of accelerated ions (likely protons or deuterons) escaping the accelerator and ionizing the surrounding air causing a blue glow. This phenomenon of air ionization is analogous to the one responsible for producing the "blue flash" infamously noted by witnesses of criticality accidents. Though the effect is often mistaken for Cherenkov radiation, this is not the case. The cyclotron was an improvement over the linear accelerators that were available when it was invented. A linear accelerator (also called a linac) accelerates particles in a straight line through an evacuated tube (or series of such tubes placed end to end). A set of electrodes shaped like flat donuts are arranged inside the length of the tube(s). These are driven by high-power radio waves that continuously switch between positive and negative voltage, causing particles traveling along the center of the tube to accelerate. In the 1920s, it was not possible to get high frequency radio waves at high power, so either the accelerating electrodes had to be far apart to accommodate the low frequency or more stages were required to compensate for the low power at each stage. Either way, higher-energy particles required longer accelerators than scientists could afford. Modern linacs use high power Klystrons and other devices able to impart much more power at higher frequencies. But before these devices existed, cyclotrons were cheaper than linacs. For several decades, cyclotrons were the best source of high-energy beams for nuclear physics experiments. Several cyclotrons are still in use for this type of research. The speed at which the particles enter the cyclotron due to a potential difference, V.
This shows that for a particle of constant mass, the frequency does not depend upon the radius of the particle's orbit. As the beam spirals out, its frequency does not decrease, and it must continue to accelerate, as it is traveling more distance in the same time. As particles approach the speed of light, they acquire additional mass, requiring modifications to the frequency, or the magnetic field during the acceleration. This is accomplished in the synchrocyclotron. circling in a magnetic field. The rest mass of an electron is 511 keV, so the frequency correction is 1 percent for a magnetic vacuum tube with a 5.11 kV direct current accelerating voltage. The proton mass is nearly two thousand times the electron mass, so the 1 percent correction energy is about 9 MeV, which is sufficient to induce nuclear reactions. An alternative to the synchrocyclotron is the isochronous cyclotron, which has a magnetic field that increases with radius, rather than with time. The de-focusing effect of this radial field gradient is compensated by ridges on the magnet faces which vary the field azimuthally as well. This allows particles to be accelerated continuously, on every period of the radio frequency, rather than in bursts as in most other accelerator types. This principle that alternating field gradients have a net focusing effect is called strong focusing. It was obscurely known theoretically long before it was put into practice. 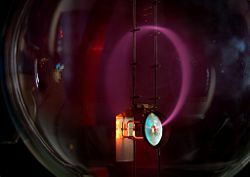 Magnetron: The spiraling of electrons in a cylindrical vacuum chamber within a transverse magnetic field is also employed in the magnetron, a device for producing high frequency radio waves (microwaves). Synchrotron: The synchrotron moves the particles through a path of constant radius, allowing it to be made as a pipe. It can thus have a much larger radius than is practical with the cyclotron and synchrocyclotron. The larger radius allows the use of numerous magnets, each of which imparts angular momentum, and so allows particles of higher velocity (mass) to be kept within the bounds of the evacuated pipe. The magnetic field strength of each of the bending magnets is increased as the particles gain energy in order to keep the bending angle constant. Geller, R. 1996. Electron Cyclotron Resonance Ion Sources and ECR Plasmas. Philadelphia, PA: Institute of Physics Pub. ISBN 0750301074. Wiedemann, Helmut. 2007. Particle Accelerator Physics. New York, NY: Springer. ISBN 3540490434. Wille, Klaus, and Jason McFall. 2001. The Physics of Particle Accelerators: An Introduction. New York, NY: Oxford University Press. ISBN 0198505493. Wilson, E.J.N. 2001. An Introduction to Particle Accelerators. New York, NY: Oxford University Press. ISBN 0198508298. Wilson, Richard. 2004. A Brief History of the Harvard University Cyclotrons. Cambridge, MA: Harvard University Press ISBN 067401460X. U.S. Patent 1948384 (PDF)—Method and apparatus for the acceleration of ions. "The 88-Inch Cyclotron at LBNL". 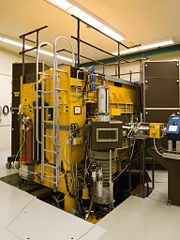 "The NSCL at Michigan State University" Home of coupled K500 and K1200 cyclotrons; the K500, being the first superconducting cyclotron and the K1200 currently the most powerful in the world. This page was last modified on 21 November 2017, at 15:40.